Donate to the Toy Drive. Bring a smile to a child’s face this holiday season. Please bring new and unwrapped gifts for children ages 1-12 to the collection boxes in the KMS Main Office. The drive runs until December 14. Basketball tryouts for 7th and 8th grade boys’ begin on Wednesday, December 5th at 5:00 and ending at 6:30. All players must have a physical and clearance form on file with Mrs. Shannon in order to participate. Please stay tuned for a 6th grade adopt a family video. Just a reminder, today is a Power Up day for Kennett Squares! 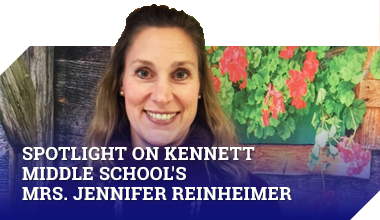 Show off your Kennett Pride and earn one today! Please stay tuned for a video on We are Kennett Night. Attention 8th grade volleyball players: don’t forget to bring $3 to Coach Clapp ASAP for your Team Lunch today in D113. Manufacturing students, you will be dismissed from our first period class via the loudspeaker. When you are dismissed, please head to Mr. Malkasian’s room to drop off your belongings. We will board the bus from there. The yearbook meeting scheduled for today will be postponed until tomorrow, Wednesday November 28th, until 3:30. Mrs. Lozada’s is out sick. Attention 8th grade volleyball players: don’t forget to bring $3 to Coach Clapp ASAP for your Team Lunch this Thursday in D113. FCA huddle tomorrow morning at 6:50 am in Mr Bowling’s room. Don’t Forget, Student Council will be hosting a canned food drive throughout the month of November to benefit the Kennett Food Cupboard. Please place canned food donations in the large cardboard boxes at the end of each wing and help us fight hunger by increasing the food supply of those in need. THANK YOU FOR YOUR HELP AND SUPPORT! Here is a reminder, it’s almost progress report time. Next week on Wednesday, December 5th starts the second half of this marking. You will get your progress report to take home. What’s so cool about manufacturing students, if you have not turned in your permission slip for the trip tomorrow, please do so today. Additionally, you will be dismissed tomorrow over the loudspeaker. Go to your first period class as scheduled and wait for dismissal. These students must come to the TV studio right now to get an additional permission slip. There will be a yearbook meeting tomorrow, Tuesday November 27th until 330 in Mrs. Lozada’s room. Winter Cheerleading will begins today, Monday, November 26th from 2:40-4:30. All interested students should meet Coach Schuessler at the locker rooms after dismissal. During Parent Teacher Conferences this week, please stop by the PTO table and pick up some spirit wear, just in time for the winter season. We will have long sleeve shirts for $10 and sweatpants for $20. Please see pictures below. All proceeds benefit the PTO and support our KMS students and faculty. Accepting cash and checks only. Remember, this week Tuesday, and Wednesday are half day conference days. Make sure you join your parents for your conference. See you there! In conjunction with Kennett High School, Student Council will be hosting a canned food drive throughout the month of November to benefit the Kennett Food Cupboard. Please place canned food donations in the large cardboard boxes at the end of each wing and help us fight hunger by increasing the food supply of those in need. THANK YOU FOR YOUR HELP AND SUPPORT! We will not have morning announcements tomorrow, Wednesday November 21st because we come to school and start in 4th period. Remember we start school tomorrow in 4th period. Due to parent teacher conferences, we will not host Work Wednesday this week. Work Wednesday will resume the following week. Winter Cheerleading will begin Monday, November 26th from 2:40-4:30. All interested students should meet Coach Schuessler at the locker rooms after dismissal. Remember, this week Monday, Tuesday, and Wednesday are half day conference days. Make sure you join your parents for your conference. See you there! Attention all students, please be reminded that with the half-days this week there will be no breakfast served. Breakfast will continue on Monday the 26th. See you then. Now over to Mr. Moore with a Pride Matrix Mash-up. During Parent Teacher Conferences next week, please stop by the PTO table and pick up some spirit wear, just in time for the winter season. We will have long sleeve shirts for $10 and sweatpants for $20. Please see pictures below. All proceeds benefit the PTO and support our KMS students and faculty. Accepting cash and checks only. Remember that next week Monday, Tuesday, and Wednesday are half day conference days. Make sure you join your parents for your conference. See you there! Attention all 8th graders. Today is the Adopt a Family Volleyball game. You will be heading to your 7th period at the normal time but will be dismissed from there to the Gym for the game. Congratulations to all students who made honor roll for the first marking period. Notice your name on the scrolling announcements. There will be Reading Olympics meetings at all lunches in the library, today, Wednesday. FCA huddle will be tomorrow morning at 6:50 in Mr bowling’s room.